You are here: Home / Ethnicity / Do religious people volunteer more? Among ethnic minorities in Britain, religious people are more likely to volunteer, but only for ethnic and religious organisations, explains Dr Ingrid Storm. Since the 1990s, the government has involved ‘faith groups’ as partners in local policy and service provision in order to promote civic participation and community cohesion. However, it is as yet unclear whether religious participation has an integrating or segregating effect on immigrants and ethnic minorities. In general, religion is seen as increasing voluntary and civic participation in both religious and non-religious organisations. However, research on this relationship has largely been conducted on majority Christian populations in the US and Europe. My recent article in the European Sociological Review examines this relationship in Britain for an ethnic minority sample, as well as for a sample of the general population. The aim was to investigate whether this relationship is the same for ethnic minorities – who are on the whole both more religious and more disadvantaged socially and economically – as for the white British population. The sociologist Robert Putnam distinguishes between bridging and bonding social capital. Religious groups, like all organised communities, may facilitate the creation of friendships and network ties, or what Putnam calls “bonding social capital”. Secondly, some religious communities’ altruistic ethos and traditions of volunteering may connect people from different social backgrounds and thus create “bridging social capital”. The distinction between bridging and bonding could have implications for ethnic and religious integration. On the other hand, previous research by Uslaner and Conley has shown that immigrants who join ethnic organisations and no other organisations do not necessarily increase their general civic engagement and might even reduce their participation in the wider community. Religious organisations, while sometimes ethnically diverse, may similarly fail to promote relations with a largely secular majority population. The Ethnic Minority British Election Survey (EMBES), conducted in 2010, had 2,787 respondents, all from ethnic minorities in Great Britain. This enables us to compare minority religions whose numbers in national population sample surveys are normally too small to analyse in detail. The sample contains 1,149 Muslims, 684 Christians, 316 Hindus and 230 Sikhs, as well as 282 with no religion. The respondents were asked whether they had volunteered over the past few years. They were also asked whether they had participated in an association or club in the past 12 months and how many members of that association were from the same ethnic or religious group as themselves. We can distinguish between ‘bridging associations’, where the respondent’s ethnic or religious group was in the minority (less than half), and ‘bonding associations’, where their ethnicity or religion was in the majority (about half or more). It should be noted that the question does not specify whether it is the respondent’s religion or ethnicity or both that is shared with other members. In other words, those in bonding associations may be ‘bridging’ across either religious or ethnic gaps, but not both at the same time. The analysis showed that religious people were more likely to participate in bonding organisations. However, they were less likely to participate in bridging organisations where their religion or ethnicity was in a minority. There were some differences between religious traditions – as can be seen in the graph – but people of all religions were more likely than the non-religious to belong to bonding associations and less likely to belong to bridging associations. Moreover, there was a negative association between bonding and bridging organisations in the ethnic minority sample. In other words, people who volunteer for a religious or ethnic organisation were not more likely to volunteer for other voluntary organisations. These results held after controlling for age, gender, education and a number of other variables. 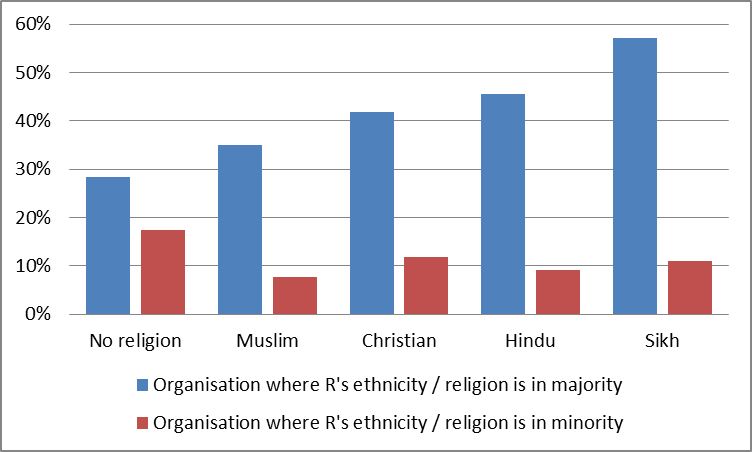 From these results, it would seem that participation in ethnic and religious organisations is unlikely to lead directly to other types of organisational involvement for ethnic minorities in Britain. However, as recent research by Demireva and Heath indicates, ethnic and religious community organisations may promote different forms of community cohesion as well as political and civic integration over a longer period. The findings from this study indicate that if civic participation per se is a policy goal, then we can be relatively satisfied: A fairly high percentage of people from all the major religions and ethnicities in Britain volunteer and engage in civic activities. If the goal is integration across religious and ethnic groups, however, then faith organisations may not provide the best ways to achieve it. Religious organisations’ main purpose is to bring people of a similar faith together and this they appear to do very well. People who belong to these organisations are understandably more likely to get involved in volunteering with people of similar backgrounds and beliefs to themselves. This may be particularly the case for actively religious ethnic minorities. It is thus questionable whether faith organisations are best placed to facilitate community integration across ethnic and religious lines. 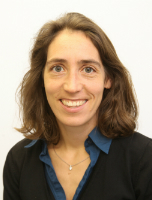 Dr Ingrid Storm is a British Academy Postgraduate Research Fellow at the University of Manchester’s Cathie Marsh Institute for Social Research. Does religion matter for attitudes towards immigration?